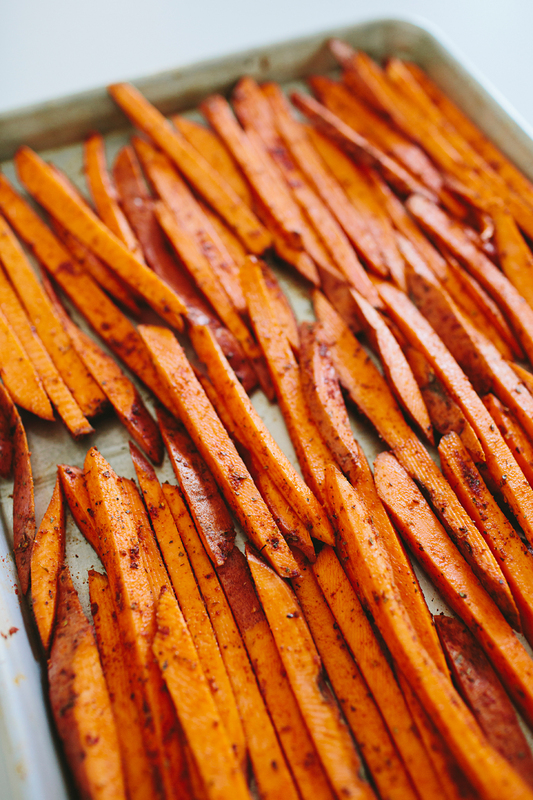 How To Make Sweet Potato Fries In The Oven! 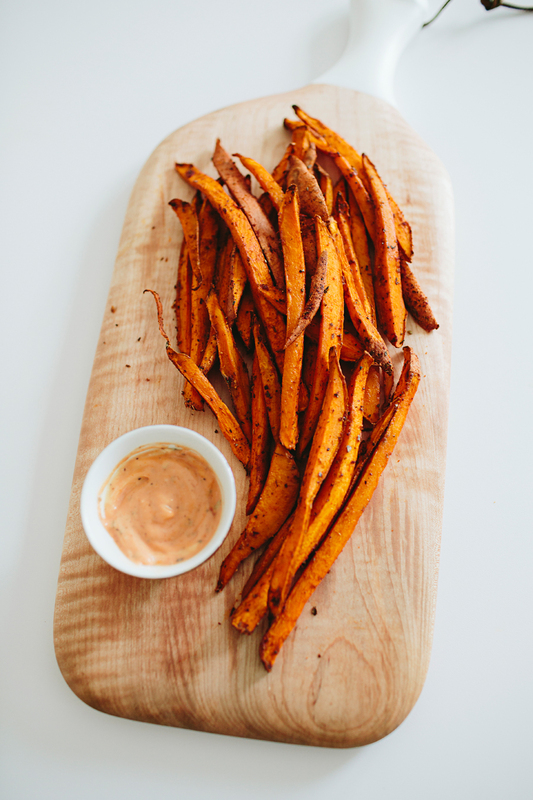 I could eat sweet potato fries several times a week and never complain about it. They're just so dang delicious. And when homemade in the oven (no deep fryer! = less calories! ), they're the perfect addition to your meal. Who am I kidding, they're the perfect meal. Our little June (currently 14 months) loves them and slurps them down like they're noodles. 😂 It's so cute. And since these fries are baked in the oven... that means dipping them in Sweet Sriracha Fry Sauce is okay, right? Yea, I thought so too. Oh, and here is a super official chart to show you how much I eat these fries now. Start by slicing your potatoes or yams into thin fries. Use a sharp, heavy duty knife, as they can often be very hard to slice. Once you've cut up all your fries, place them in a clean bowl. Rinse the sliced fries in cold water to remove any dirt, and then let the fries soak in the cold water for at least 10 minutes, or up to a few hours. Soaking them in cold water will remove some of the starch, allowing for a crispier fry in the end! Change the water occasionally, if you decide to soak them for longer than 10 minutes, to remove the cloudiness of the water and starch at the bottom of the bowl. Once you're finished soaking them, rinse them one last time and do your best to get as much water out of the bowl as you can. Now to make them extra delicious! Coat fries well in olive oil. Then add spices -- there is no exact measurement for the spices, because it depends how many fries you're making and how strong you'd like the flavor to be! For the three large yams I used here, I would guess I was around 2 teaspoons of the garlic powder, paprika, chili powder and dried oregano. (Feel free to use more or less once you've figured out what you like best!) What I normally do is sprinkle all a little bit of all four of those ingredients on the fries, give them a good shake/mix, and then sprinkle the same stuff on them again - repeating this maybe four times. It seems easy to add the spices to the fries in several rounds, instead of just dumping it all in there and hoping they all get well coated. Once spices are added, salt and pepper to taste. 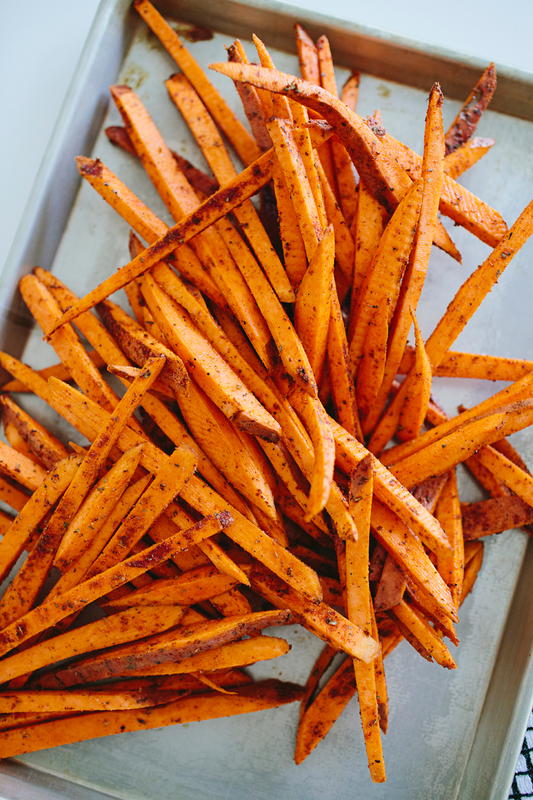 Dump the fries out onto a baking sheet and arrange them into a flat layer. The less they overlap the crispier they will get! As you can see, I was really excited about the fries for lunch the other day, and packed my pan pretty full. Place into a 425° oven for 20-30 minutes. If you have a convection oven, use it! That will help them cook faster and get a little crispier, too! While your fries are cooking, start mixing your sauce. 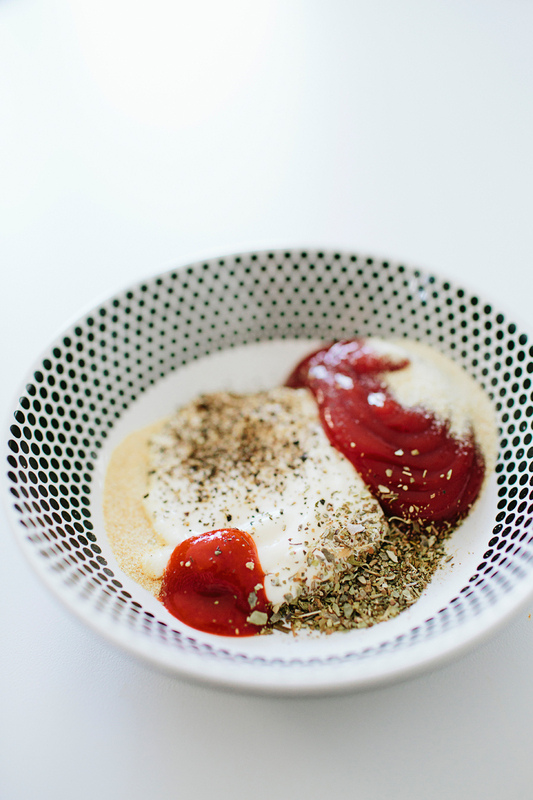 Combine equal parts mayonnaise and ketchup. Add a much smaller amount of Sriracha sauce. (The sauce can get spicy fast! So keep in mind that you can always add more if you feel it needs more heat, but you can never take it away! Start small.) Add garlic powder, onion powder, black pepper, and dried oregano. Mix until well combined! Before I remove the entire tray of fries from the oven, I always poke one of the larger ones with a fork and test it out, just to make sure they're cooked all the way through. Once cooked, remove them from the oven, and if you can wait, give them a few minutes to cool on the tray before you start eating them! Also, resist the urge to dump the entire tray onto a large plate, causing them to pile one on top of another. This will make the fries get soggy really fast, from the heat and steam they release. Serve them directly onto your plate, and enjoy! If you make these fries, be sure to tag me in a photo of them on Instagram (@brookecourtney) or send me a Snapchat (@brookemousetis) - I'd love to see 'em!